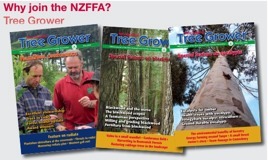 Bill Libby, New Zealand Tree Grower August 2007. My wife Iris and I recently led a tour of American friends from Auckland to Milford Sound. 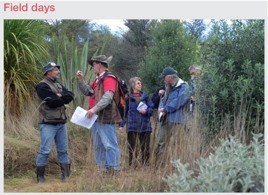 Then I was hosted by a series of New Zealand redwood enthusiasts on the return trip north. One of those enthusiastic hosts asked for my 2007 impressions of redwoods in New Zealand. As background, I became increasingly intrigued by the possibility of seriously growing redwoods in New Zealand during visits to New Zealand forests from 1971 to about 1990. I was of course informed that redwood had already been seriously tried, not once but twice earlier in the 1900s, and redwood plantations had massively failed both times. In addition, the few redwoods that had survived had grown too fast and the wood was no good. We lived in New Zealand for part of the time from 1991 to 1999. During those years it became increasingly clear that people, particularly some farm foresters, were by then successfully planting redwoods, and they were often growing well. Also, while true that wood of fast-grown redwoods is not as good as that of old-growth redwoods, by 1991 most old-growth redwoods had been cut and those remaining were mostly in protected parks and reserves. Wood of second-growth redwood was, to the surprise of many experts, being accepted and increasingly valued in the US market, and fast-grown New Zealand redwood wood was little different from it. As a hobby, during the 1990s I was alert for and tracked down examples of both the Sierra redwood (giant sequoia) and the coast redwood in New Zealand. I found most of those I observed by myself, but was guided to the rest by foresters and others who knew of them. Coast redwood could be found growing well over a range of sites in New Zealand, but it is fussier about site than radiata pine. In particular, it is badly affected by chronic winds, particularly if those winds are salt-laden. Surprisingly to me, giant sequoia could be found growing well from near sea level to near the timber line. This was surprising because, in both Europe and the United States, giant sequoia below about 800 metres elevation usually get the stress disease Botryosphaeria, and the nearer to sea level it was planted, the worse the disease. So, what did I find different this year? First, I visited a 30-year- old trial of giant sequoia containing trees from eight of what have proved to be among the best native groves in North American and European trials. After an initial slow start, they are now growing very well. Surprisingly, they are also producing viable seeds, an event that has not been observed at that young age in either Europe or North America. This trial may be important in founding not only a New Zealand land race of giant sequoia, it may well be producing the best giant sequoia seeds of any source on Earth. Second, a number of my hosts had sharpened their redwood eye, and had found redwood groves in the 60 to 80-year age range that were not generally known to the forestry community before about 2000. We visited several of these, all with the same result. The owners all expressed a commitment to grow them on to be much older and larger than they currently are. We discussed pruning and thinning, to improve aesthetic appearance and growth rate of the already very large dominant redwoods, and perhaps making some modest financial return on the thinnings. But clearfelling and replacing these groves was never an option. While it remains apparent that redwood is more site-limited than radiata pine, it is now clear it grows well over a large proportion of New Zealand. Some farm forestry trials, established in over 50 locations, are beginning to yield information on where they grow wonderfully, merely well, or should not be grown. This, along with recent experience with pre- and post-planting care, in particular good site preparation, attention to nutrient status, and control of competing plants, now results in much better survival and early growth than previous experience with redwood had led us to expect. Current trials with promising clones should soon provide redwoods that reliably grow with better form. Eventually some of them will be known to have heartwood that is much better than that now reliably available either in California or in New Zealand. Some giant sequoias with symptoms consistent with Botryosphaeria were observed. If this disease is now beginning to infect giant sequoias, this should be evaluated with respect to the future of this iconic and magnificent tree in New Zealand.